A spectacular cabinet of curiosities brought to life by a mystical force. Riccardo Tisci is a collector of religious jewellery, skulls, old Mexican carpets, all of which fed into a collection that somehow managed to feel cohesive. “I’m collecting dreams,” he explained backstage. This dream also had to include women, so he created a handful of womenswear looks just for this collection, enabling him to express himself fully. “This is a moment in my life where I’ve found serenity and I’m very happy with what I’m doing. It really was a spread of everything – urban, couture, skulls, romanticism, different cultures, different eras. When I was with Katy England, who works with me on the show, I told her what I wanted to do – romanticism, witches, angels, Peru, skulls – she was overwhelmed, but when she saw the collection, she understood the message. I’m very faithful to myself. When you do things that are true it just comes out quite instinctively.” Tisci likened this extraordinarily rich and storied collection to a De Chirico painting, where there are many doors and corridors leading you everywhere. With ghostly faces and skulls abounding, you could say the collection was like a haunted house ride – only one you wouldn’t mind being trapped inside. Backstage after the show, people congratulated Pat McGrath as much as they did Tisci. It was a stunning feat of skill and creativity as some of the models’ faces were smeared and smudged into ghoulish characters, inspired by a mix of skulls, cultures and tribes. On the girls, flakes of paint coupled with crystals adorned their faces and bodies, as if to reflect a beauty in the decay of objects. 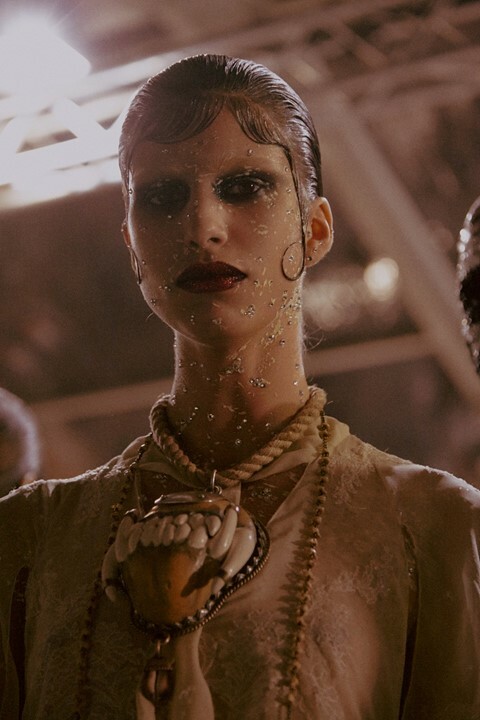 The biggest feat was the face of a bejewelled creature, dripping with shells, rhinestones, metal discs and pearls, stuck directly on to the skin. She was an otherworldly being leading this eclectic crew. Like the show, there wasn’t anything uniform, symmetrical or even sensical about the make-up, which made it all the more breathtaking to witness.